Barbier, E.B. Natural Resources and Economic Development, Cambridge University Press, Cambridge and New York, 2nd edition, in press. Barbier, E.B. 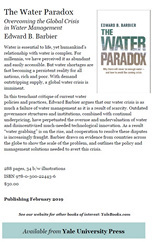 The Water Paradox: Overcoming the Global Crisis in Water Management. Yale University Press, New Haven and London, 270 pp. Barbier, E.B. 2015. 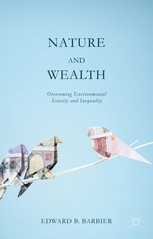 Nature and Wealth: Overcoming Environmental Scarcity and Inequality. Palgrave Macmillan, London, 262 pp. Barbier, E.B. and Markandya, A. 2012, A New Blueprint for a Green Economy. Routledge/Taylor & Francis, London, 200 pp. Barbier, E.B. 2011. 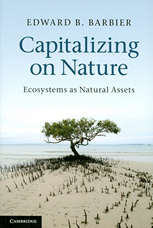 Capitalizing on Nature: Ecosystems as Natural Assets. Cambridge University Press, Cambridge and New York, 321 pp. Barbier, E.B. 2010. Global Green New Deal: Rethinking the Economic Recovery. Cambridge University Press, 308 pp. Hanley, N. and Barbier, E.B. 2009. 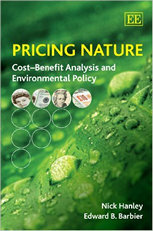 Pricing Nature: Cost-Benefit Analysis and Environmental Policy-Making. Edward Elgar, London, 360 pp. Barbier, E.B. 2005. Natural Resources and Economic Development. Cambridge University Press, 410 pp. Heal, G.M., Barbier, E.B., Boyle, K.J., Covich, A.P., Gloss, S.P., Hershner, C.H., Hoehn, J.P., Pringle, C.M., Polasky, S., Segerson, K. and Shrader-Frechette, K. 2005. 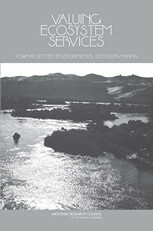 Valuing Ecosystem Services: Toward Better Environmental Decision-Making, The National Academies Press, Washington, D.C, 277 pp. Barbier, E.B. and S. Sathirathai (ed. 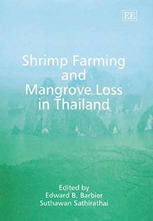 ), 2004, Shrimp Farming and Mangrove Loss in Thailand. Edward Elgar Publishing, London, 278 pp. Barbier, E.B. 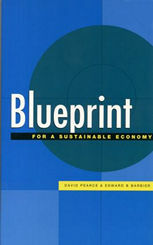 and Pearce, D.W., 2000, Blueprint for a Sustainable Economy. Earthscan, London, 272 pp. Barbier, E.B. 1999, The Economics of Land Degradation and Rural Poverty Linkages in Africa. UNU/INRA Annual Lectures on Natural Resource Conservation and Management in Africa, November 1998. United Nations University Press, Tokyo, 132 pp. 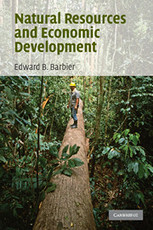 Barbier, E.B., 1998, The Economics of Environment and Development: Selected Essays. Edward Elgar, London, 540 pp. Barbier, E.B., Acreman, M. and Knowler, D., 1997, Economic Valuation of Wetlands: A Guide for Policymakers. Ramsar Convention Bureau, Geneva, 127 pp. Barbier, E.B., Burgess, J.C. and Folke, C., 1994, Paradise Lost? The Ecological Economics of Biodiversity. Earthscan Publications, London, 267 pp. Barbier, E.B., Burgess, J.C., Bishop, J.T. and Aylward, B.A., 1994, The Economics of the Tropical Timber Trade. Earthscan Publications, London, 179 pp. Barbier, E.B. (ed. 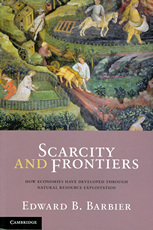 ), 1993, Economics and Ecology: New Frontiers and Sustainable Development. Chapman and Hall, London, 205 pp. Swanson, T.M. and Barbier, E.B. (eds. ), 1992, Economics for the Wilds: Wildlife, Wildlands, Diversity and Development. Earthscan Publications, London, 226 pp. Barbier, E.B., Burgess, J.C., Swanson, T.M. and Pearce, D.W., 1990, Elephants, Economics and Ivory. Earthscan Publications, London, 154 pp. Conway, G.R. 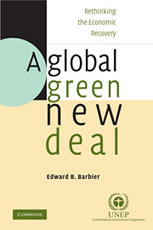 and Barbier, E.B., 1990, After the Green Revolution: Sustainable Agriculture for Development. Earthscan Publications, London, 205 pp. Pearce, D.W., Barbier, E.B. and Markandya, A., 1990, Sustainable Development: Environmental Economics in the Third World. Edward Elgar, London, 217 pp. 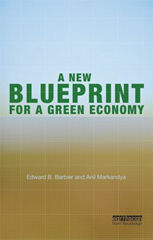 Pearce, D.W., Markandya, A. and Barbier, E.B., 1989, Blueprint for a Green Economy. Earthscan Publications, London, 192 pp.